AutomatedBuildings.com Article - What the Heck Hardware do I Use for Auditing? Do I Use For Auditing? "What type of hardware is recommended for running an audit?" This article works towards explaining the available hardware options and to answer this question. One of the first questions that we are asked when automating building audits is: "What type of hardware is recommended for running an audit?" This article works towards explaining the available hardware options and to answer this question. People have actually used a variety of hardware types to automate audits in the past. You may have already seen attempts to "electrify" audits using a laptop or notebook computer. However, the cost of purchasing a full laptop for each inspector or auditor often makes that approach prohibitive for a lot of companies. The rapid growth in Personal Digital Assistants or PDAs (see definition) use over the last few years has lowered the cost of automating audits. PDAs are more user-friendly than laptops, both in terms of size, in mobility, and how they can be used. An example of this last point is that there are now phone/pda combinations, which reduce the amount of things that you have to carry, by eliminating a separate phone. Also, most PDAs allow the user to WRITE thoughts in, rather than being only able to TYPE things in -- something that is more comfortable for the average user to do. Figure 1 shows some of the major types of hardware available to run audits on. You have choices based on operating system, form factor, and what other applications are available to run alongside your audits. There are a number of types of handheld platforms to select between, but the major choices are between a Pocket PC (which uses WinCE, a version of Microsoft Windows); Palm (and their licensee friends); a browser-based phone device (Nokia for example) or, on the larger side of things, a Tablet PC. Pocket PCs and Palm devices are similar in nature, differing more in operating system ideology than in actual feature or function. They are both small computers and include applications like to-do lists, address books, calculators, expense tracking and calendars. Add-in programs are either provided or are available offer spreadsheets, word processing and even things like PowerPoint for presentations. These tools are available on both of these PDA platforms. 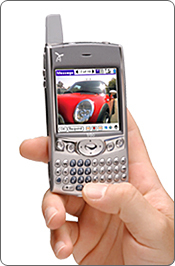 Information is entered into these PDAs via a mini-keyboard; writing directly on the screen; an external full-sized keyboard; or even voice-recordings. The tablet PC is a full-featured PC, which allows data input via writing like the smaller PDAs. In fact, many Tablet PCs do not come with a keyboard (although they are often available as an option). If you are comfortable carrying (and paying for) a 8� x 11" sized device, then this form factor is a nice replacement for the “yellow pads” of the past. Phones also fall into the PDA category today, because they are now (again, optionally) equipped with operating systems and the ability to run applications. The most important phone application to have is a good browser, allowing the user to access the internet wirelessly. Be aware that web content must be tailored to PDA browsers and that the phone browsers tend to be the most different. An important term in this area of hardware and software is convergence -- which just means being able to do multiple things with a device by combining the functionality of separate devices. As you can see in figure 1, the Samsung PDA unit that represents Palm is also a phone and shows how the lines between the devices are beginning to blur. + Runs a version of Windows + Better integration with Windows apps than Pocket PC has today! - Lack of standards - Cost! To go Wireless or Not to go Wireless? Some of the considerations that will go into your selection include screen (display) size, available tools, having a keyboard or not and available memory. But one of the most important issues in deciding what hardware to use, is whether you need your auditors/inspectors to have wireless access or not. If the handheld device is connected to the office wirelessly then the user does not need to return to the office to "synch"ronize information with their PC or office network. Data entered into the PDA can be sent to the office (or their PC) through this wireless connection; WHILE the user remains in the field. + Data can be sent in from the field. Less trips to the office. + More security as data resides in the office, not on the handheld. + Based upon the results of the audit, additional information (or things to check for) can be sent to the auditor WHILE they are at the client. + Very cost effective in semi-remote areas -- where travel time to the client is high. - Connection costs (phone line charges) are additional. - Handheld hardware costs will be a bit higher. - Wireless networks not available in all areas. Our recommendation today, budget-permitting, is to use a wireless, Palm OS-based phone combination, such as the Handspring (now Palm) Treo 600. This allows you to consolidate the actual data that is entered into a single web site that all of your handheld users access wirelessly. The wireless option also allows you to have things like your Price and Contact lists all in one place (the website), thereby ensuring that the same information is being used by all of your users at the same time. This approach makes it easy to maintain (and report on) the data and lowers the human-costs associated with manually synchronizing data. Additional hardware-specific recommendations are to get as large a screen as possible (240x320 is recommended when available) and to decide internally what type of data input device is preferred for your company -- whether that be by writing, mini-keyboard or external keyboard. Supporting one of these options, rather than all, will reduce your overall support costs. Color screens are important, especially if the PDA is to be used with a variety of websites. Finally, consider “local wireless LAN” add-ons, such as Bluetooth or 802.11 (b or g) cards (click here for more information about wireless LANs). Wireless local LANs are useful in the office to reduce wiring costs between ALL hardware; do not require air-time-phone-plans; and, are rapidly growing in popularity. In addition, Bluetooth connectivity will allow an inspector to (wirelessly!) print to a small carry-along bluetooth-equipped printer while at the customer site. This printing ability is a great feature for things such as punch lists and for customer work-order signoffs. The technology is available today to reduce the errors that result from pushing paper and your data around.